Everyone does well in a different way. Which is why we’ve designed a well-being event that’s different than the rest. With Destination Kohler, the Midwest’s premier luxury resort as a backdrop, guests will be treated to a fun and fresh perspective on the world of well-being featuring some of the most focused and influential figures including Daphne Oz and Anna Kaiser. 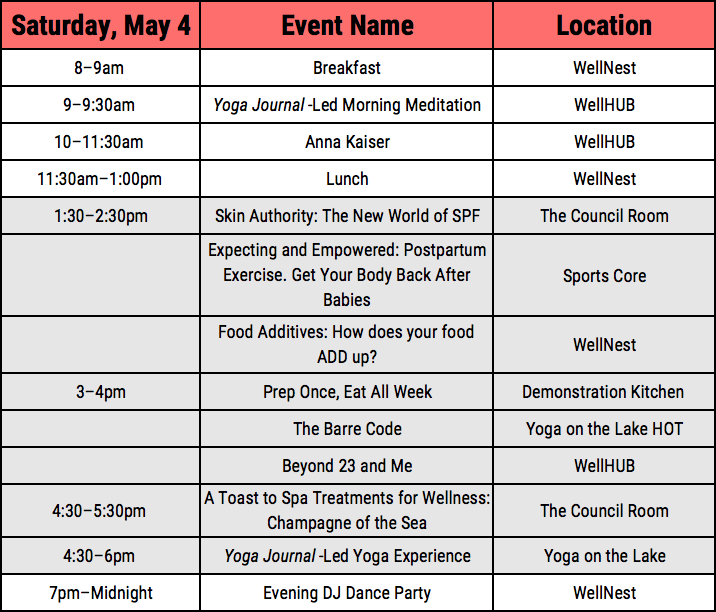 Connect and grow with all at the Core Community events (white) and customize your itinerary by choosing the optional breakout events that enhance your Well (gray). Explore the details of your weekend journey. Join Ariana and Jillian for the most efficient and results-driven exercise program that goes beyond the bar. The Barre Code workouts offer comprehensive programs centered around cardio, strength and restoration. Enjoy an organic lunch from the chefs of Destination Kohler. Selecting the right shoe is extremely important for running and exercise. Get tips on selecting the right footwear, and learn about prevention of and treatment for common foot injuries. Take this time to interact with Daphne. Join Tracy and Bonnie for a taste of the Shred415 studio experience. Shred415 combines the infectious energy of group training with the flexibility and focus of a personalized program—in an incredibly supportive environment. You control how hard you work, matching your pace and weights to your level and goals. Four 11-minute intervals—that’s how we shred. Enjoy indulging in craft cocktails featuring Wisconsin liquor. Destination Kohler premier chefs will be on hand dishing up nice-and-naughty food bites. Dance the night away with hits from DJ Ghost, and enjoy a variety of cocktails and beverages at Bold Cycle. Using "secret" ingredients, like avocado and coconut butter, and no refined sugar, we’ll make indulgent, luscious breakfasts, snacks and desserts that will love you back. Physical therapists from Prevea Health will be presenting information about trigger point dry needling, a minimally invasive technique that uses sterile, thin, solid filament needles to reduce tightness and banding of muscle trigger points. Trigger point dry needling assists with relaxation of tight muscles, improving firing patterns of weak muscles, and reducing pain. You will have an opportunity to try and/or observe this technique, which works well for many musculoskeletal conditions. Returning to exercise too quickly postpartum can make your body feel out of sorts. We want you to stop thinking that that is just the way it is after having kids. We will dive deeper into getting your abdominals back, having strong hips and back muscles needed for mothering, and we will teach you how to get your body back in sync after babies. No matter if it's been 2 months or 20 years since your last baby, changing up your exercise routine can make a difference. Recent studies suggest that about 70-90 percent of the risk factors for skin damage and chronic disease are caused by the sum total of environmental exposure–sun, blue light, radiation, chemicals, diet and pollution. There is growing concern that even the sunscreens we use to protect us are not up to the job and may even contain harmful chemicals of their own. Also, a growing base of research shows that there are expanding health benefits to sun exposure, and it encourages us to live sun-exposed lifestyles which require new thinking about how to protect our bodies in the elements. Today’s more natural approaches offer only limited protection with unwanted cosmetic effects. Wellness-conscious consumers are invited to learn about the present environmental risk factors beyond SPF and the emerging technologies to help you thrive and maintain an active, healthy protected lifestyle. Aromatherapy associates specializing in wellness, mindfulness and leading a balanced life. We carefully source ingredients from around the globe using them to create our unique blends. Leaders in aromatherapy, we address your specific concerns and take you on a sensory journey to enhance your well-being. Unlock your "inner therapist" and experience an aromatherapy consultation through the sense of smell to identify your body’s needs. Each blend was developed to address the modern stresses on mind, body and skin: easing sore muscles, aiding sleep or soothing an overactive mind. Presenter: Angela Eriksen-Stanley, Director of Education Phytomer Group Where does your skin care really come from? Join us to learn about the origins of Phytomer, an innovative company that transforms the sea into skin care using the most responsible, green, and eco-friendly methods at each step of manufacturing. We believe in the sea and the power of its natural ingredients and we create our products with respect for the sea and consumer safety. Grab-and-go organic breakfast at the WellHUB. Enjoy a morning meditation to still the body and clear the mind. Join Anna for a positive energy workout you will not forget. Presenter: Celeste Hilling, Skin Authority Owner Recent studies suggest that about 70-90 percent of the risk factors for skin damage and chronic disease are caused by the sum total of environmental exposure–sun, blue light, radiation, chemicals, diet and pollution. There is growing concern that even the sunscreens we use to protect us are not up to the job and may even contain harmful chemicals of their own. Also, a growing base of research shows that there are expanding health benefits to sun exposure, and it encourages us to live sun-exposed lifestyles which require new thinking about how to protect our bodies in the elements. Today’s more natural approaches offer only limited protection with unwanted cosmetic effects. Wellness-conscious consumers are invited to learn about the present environmental risk factors beyond SPF and the emerging technologies to help you thrive and maintain an active, healthy protected lifestyle. FOOD ADDITIVES: HOW DOES YOUR FOOD ADD UP? So many additives are used in our food supply today. Which ones are safe to consume? Which ones should be avoided? Attendees will learn what food additives are, and how to decipher which food additives are safe and which are not. Make a few basic components, then learn how to mix and match them for easy meals without boredom. Join medical expert Dr. Terrell who will cover everything you need to know about genetics and your health. The sea is the richest, most vital element on earth, containing everything essential to the skin’s beauty and health. Most importantly the sea works in complete affinity with our cells, to create instant, visible results naturally. Phytomer invites you to learn about marine-based, wellness-focused treatments that transport you to the seaside for total rejuvenation and therapeutic relaxation, while combatting stress related symptoms commonly associated with a busy lifestyle. Join Yoga Journal premier instructor as she takes you through a 90-minute flow. Join Lauren and Greg as they take you on a high-intensity yoga class geared for the “gym-focused” yogi who loves to sweat, build endurance, strengthen muscles and jam to high-energy music. Then cool down with brunch and cocktails to complement your morning workout.